In a previous post I described satellites in geostationary orbit, these remaining above one point on the equator and being used for radio communications or whole-disk imaging of the Earth for meteorological and other purposes. Such satellites take precisely one sidereal day (almost four minutes short of a mean solar day) to orbit the planet, travelling at a speed just above 3 km/sec (11,000 kph). The geostationary altitude is around 35,790 km above the equator, making it 42,168 km from Earth’s centre. A note here about satellite altitudes. It is usual to state these as the height above the equatorial radius of 6,378 km, which is no problem for geostationary satellites because they do indeed remain above the equator. However, other satellites pass over a range of latitudes, and the planet’s radius varies as one moves north or south: at the poles the radius is only around 6,357 km, about 21.4 km less than at the equator. Thus the altitude of a satellite above mean sea level, or above the reference geoid (say, WGS84), alters as it moves in its orbit although its distance from the centre of the Earth may not be changing. 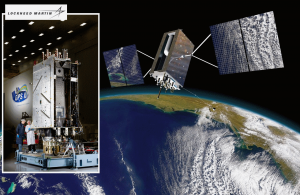 In general, navigation and timing technologies based on satellites are termed Global Navigation Satellite Systems (GNSSs), and there are several of them. In this post I will be addressing specifically the best-known and most-used such system, which is termed the Global Positioning System (GPS), or Navstar GPS. This is operated and maintained by U.S. Air Force Space Command, but provided as a free global service by the U.S. Government. In later posts I will discuss other GNSSs such as those operated by Russia (GLONASS), the European Union (Galileo), and the People’s Republic of China (BeiDou). In the present post by the acronym GPS I mean the U.S. system alone. The first GPS satellite was launched in 1978, but full operational capacity did not begin until 1995. Since then there have been multiple updates in capability as new satellites have been added to the constellation and older ones have been retired. At present the network consists of 31 functional satellites. Above: At left a GPS Block III satellite on the ground prior to launch. 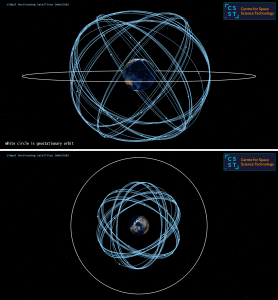 On the right is an artist’s impression of the satellite in orbit, drawn with some licence: in reality the GPS satellites fly in much higher orbits than that suggested, and the tilt of the solar panels would obviously not reflect to a viewer the surface of the Earth as imagined by the artist. The graphic below shows the 31 satellite orbits, arranged in six planes that are tilted by about 55 degrees to the equator. The minimum number of satellites to make the system fully operable is 24, with four in each of the six planes; having more than that results in some redundancy and the ability to replace rapidly any malfunctioning satellite by using an ‘on-orbit’ spare. Nominally the satellites have orbital periods of half a sidereal day, close to 718 minutes, although there is some variation with gravitational tugs by the Moon and the Sun in particular causing the orbits to wander slightly over time. This orbital period indicates a distance 26,564 km from Earth’s centre, or an altitude 20,186 km above the equator. 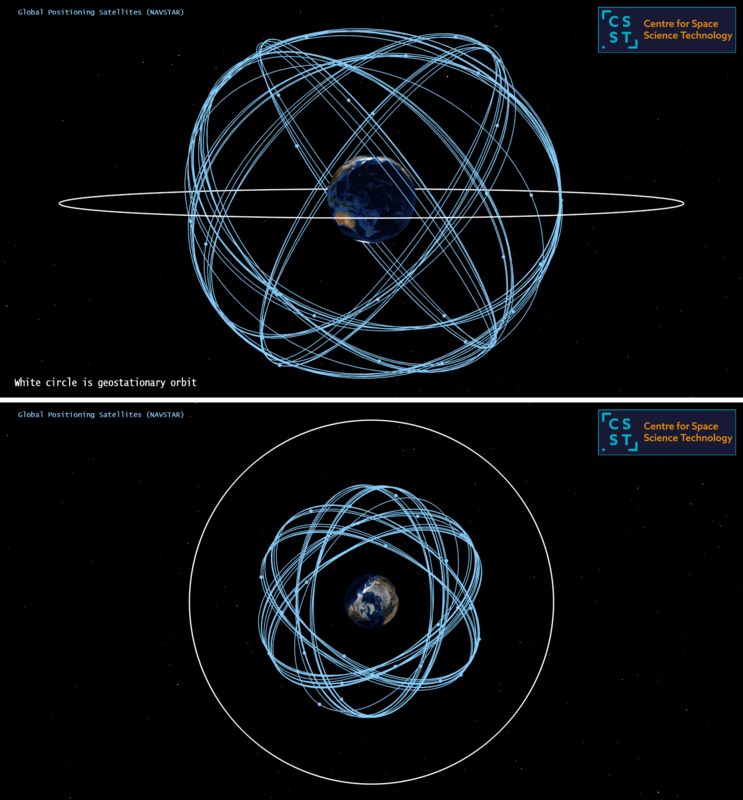 The reality is that individual satellite orbits are not precisely circular, and so their geocentric distances also vary slightly during each circuit of the planet. Being at a lower altitude than geostationary, the satellites move faster, at around 3.875 km/sec (just less than 14,000 kph). 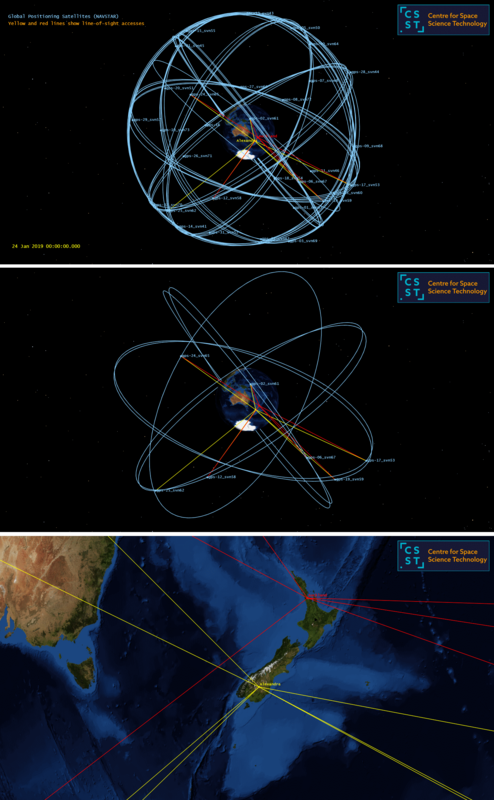 The orbits of the 31 satellites currently operational in the GPS constellation. The upper panel shows a side-on view, whilst the lower panel is a downward aspect from above the North Pole. The white circle shows the geostationary orbit location, for reference. The design of the constellation is based on a functional requirement for any point on Earth’s surface to have a line-of-sight at more than 15 degrees above the horizon to at least four satellites at any time; for GPS to function (i.e. to give you a measurement of your location) four is the minimum number, for reasons I will explain in a later post, but more can assist with the precision of any location determination. The best precision to be expected is 30 cm, but generally the performance is not as good as that, dependent on where you are in the world, satellite availability variations, and the existence of line-of-sight barriers such as large buildings, or mountains (which can also result in radio echoes and therefore some confusion). Using the STK program (from Analytical Graphics, Inc.) I have set up the full constellation of GPS satellites in a scenario (as depicted in the preceding diagram) and then inserted the locations of Auckland and Alexandra (which some people believe to be the centre of the known universe). I have then set the time to the midnight UTC at the start of 2019 January 24. The diagram below shows which GPS satellites would have delivered timings (and therefore positional information) if you had been in either place at that instant: six satellites for Auckland (red lines), and seven for Alexandra (yellow lines). Within STK I stipulated that the satellites needed (as stated earlier) to be at least 15 degrees above the horizon for a ‘smooth’ Earth shape, which is not a problem for Auckland (unless the line of sight were blocked by buildings), but could be in Alexandra if one were close to any of the nearby major hills. In Queenstown, say, this limitation would be exacerbated by the surrounding mountains, and this is why GPS coverage can be intermittent when in rugged country: you may need to wait a while for four satellites to be clear of local obstructions. Line-of-sight accessibility to various GPS satellites as at the instant of midnight beginning 2019 January 24 UTC for Auckland (red lines) and Alexandra (yellow lines). The upper panel shows the orbits of all 31 GPS satellites, with characteristic labels for each. The middle panel is limited to the seven satellites providing signals to the two NZ locations: six to Auckland, but an additional one to Alexandra. The lower panel is simply a zoomed-in view of NZ, for clarity. The diagrams above show snapshots of the coverage for an instant in time. If one waits a few minutes, as the satellites move in their orbits (and the Earth turns beneath them) a different combination will render the needed data for any location. To show how this works dynamically, I have made a movie using STK, indicating the coverage for Auckland and Alexandra over four days (from the start of January 23rd through to the end of January 26th). This movie lasts for three minutes and 50 seconds, following the orbits in one-second jumps and at 25 frames per second. At every time-step the satellite accessibility is re-computed and displayed. The WMV movie file occupies 138 MB, and can be downloaded from here. If that is too large a download for you, a 65 MB version covering only 45 hours and lasting one minute and 48 seconds is available here. An even smaller movie (25 MB) made by Lockheed Martin is available here; it’s not as good as my own, obviously. A point to note: I am putting up this post on January 24th. The above movies are based on events that began yesterday (the start of January 23rd on UTC was 1pm/13:00 NZDT on that date) but are ongoing. It is possible to project satellite orbits into the future. If you do not believe me, you can go to Auckland or Alexandra and check whether the satellites ‘appear’ on your GPS display at the times indicated in the longer movie, through until 1pm NZDT on the 27th. 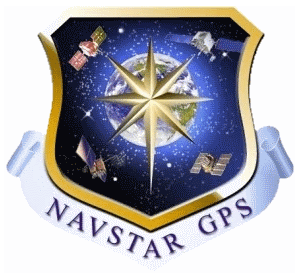 As described earlier, although the GPS constellation now provides a global public service it started out as an exclusively military system and is still run by U.S. Air Force Space Command, which has its headquarters at Peterson Air Force Base, about 10 km east of the centre of Colorado Springs, next to the civil airport. However, the Global Positioning System Operations Center (GPSOC) is located at Schriever Air Force Base which is another 15 km further east, out on the plains. I once visited the GPSOC, and remember it well; it was the first place (but not the last) I had ever needed to go through an iris scan for security purposes.